From the old French word for knighthood, "chevalerie," the art of being a chevalier (a knight or horseman). During the time of Charlemagne chivalry was a payment owed to a warrior who sat on a horse. During the Middle Ages, it was the medieval knightly system with its religious, moral, and social code. Not limited to the “West," the principles of chivalry also existed in other cultures. For example, Bushidō ("the way of warriors") in Japan and Wuxia ("martial heroes") in China were loosely analogous to the concept of chivalry in Europe. In the modern times and for our purposes we will examine chivalry as the code of behavior and ethics that was supposed to dictate the behavior of knights and nobles. 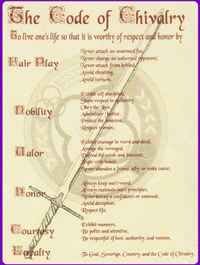 Before we start looking more into the Code of Chivalry, in order to understand it and apply it in today’s society we need to put it in historical context. In movies and in art, knights are depicted a very specific way, usually wearing “head-to-toe” plate armor. In the early to Middle Ages, just after the time of Charlemagne and into the high Middle Ages, this is not the norm. The knight in the early days would wear a mail shirt, something that would deflect a blow but wouldn't necessarily be too cumbersome. He Would wear a lot of padding to take blunt-trauma and at times wear some kind of a helmet to protect the head. What marked a knight was not so much what he wore but what he rode. A knight always was someone who owned and rode a horse. Not a small feat since the cost of purchasing and maintaining a horse was quite steep, especially coupled with the need for a squire to tend to the horse and the armaments. Around the Year 1000 or even as far back as the 800s, to be a knight did not actually mean that you were upper-class. Actually, it meant that you were part of the “blue-collar” class. If you were a knight, you very well could have become a knight simply by the fact that you bought a horse, you bought a sword, you learned how to use it and then you went off to war. So, to be a knight really meant nothing more than you had the paraphernalia and the weaponry required of a knight. Those who distinguished themselves by excelling in battle were rewarded with grands of land. After a few generations, the landholding knights became more or less nobles or at least they had a capacity to rise up to nobility. 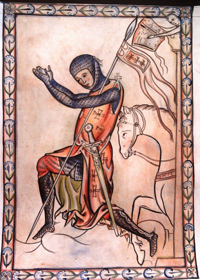 A distinction between "knights" and "nobility" arose sometime between 1000 and 1300 A.D. The nobles, those in the top rung, didn't like the fact that they were vulnerable, so they did a number of things to solidify their hold on that higher rung. The emergence of a coat of arms. Through a highly regulated process, usually involving the king, only those who were noblemen could have a family crest. If you had a shield and a coat of arms that you could display, this indicated that you were noble. Nobility begun to stress their bloodlines. That their father and their grandfather and so on, back to some historic figure, is the reason why they are noble. That they rule because their family has always ruled. Patronymics. Today we all have a last name, our family name. This was not the case in the Middle Ages. A patronymic or a last name indicated what family you were a part of and became over time one of the hallmarks of being part of the nobility. So even if you were a lower rung knight with wealth, land, and a castle, you were not a "nobleman" unless you also had a coat of arms, a traceable bloodline, and patronymic. To continue reading the "rest of the story," please click here.